A packing based on graphite enhanced PTFE. Allowing effective, long lasting sealing in both valves and high-speed pumps. includes compression packings, moulded sets, low emission sets and specialised products. Ongoing Test & Development in line with the KLINGER service and quality philosophy will ensure improved performance in your pump and valve applications. K4322 packing is manufactured from PTFE filaments, which have been pre-treated with a graphite based lubricant. 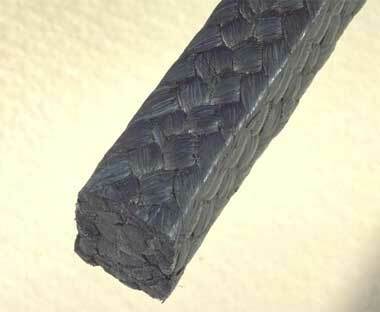 The Klingerlock braiding process is used. PTFE is extremely resistant to a wide range of chemicals, therefore K4322 is only affected by a small selection of aggressive media. It is the graphite treatment which allows the rapid dispersion of heat thus enabling the packing to operate in high speed dynamic applications where pure PTFE packing burn. It is equally effective in valve applications. Due to its wide service capabilities K4322 packing offers the user a packing material with excellent sealing life and the option of reducing the variety of packing grades that are traditionally held as stock.